Students, parents, and advocates, including the ACLU of Maryland, have been calling on state and city elected officials to work together to solve Baltimore’s school facility crisis for nearly two decades. Just eight months after freezing temperatures caused dozens of old heating systems in schools to break down, tens of thousands of City students missed more instruction time due to the lack of air conditioning. The fact that these inhumane and harmful conditions affect mostly Black children is not due simply to chance. Black and Brown students, families, and communities in Baltimore have been and continue to be disadvantaged by a system that deprives them of their basic needs. If elected officials believe that all children’s lives are valued, then it is time for the system to be redesigned to ensure they get what they deserve. Are you a parent, student, or teacher who has been impacted by heating, air-conditioning, or other building issues in school? Tell us about it. It is no surprise that City school buildings lack sufficient heating and cooling systems, among other health and safety deficiencies. City Schools is completely dependent on funding from the state and city to install new or replace old and deficient HVAC systems (and for other facility improvements). However, the amount of funding provided over recent decades has fallen far short of the need. “It’s a systematic problem that’s been going on for a long time,” said Henry Gannett, a senior at City College High School who helped organize a student press conference when his school closed because it was too hot. A blame game has been going on over the past weeks (and years) between Governor Hogan, Comptroller Peter Franchot, and other lawmakers and government officials. What they should be doing is what they were elected and mandated to do – provide a “thorough and efficient” education to all public school students in Maryland, as required by the State Constitution. Governor Hogan, state legislative leaders, and Mayor Pugh must develop a short-term plan for immediate heating and cooling needs. The plan should also include a comprehensive plan to ensure that all decrepit and outdated City school buildings are replaced or fully renovated over the next five to ten years. Senator Bill Ferguson and Jess Gartner recently offered suggestions on where to start. The Governor and others continue to point fingers at school system administration. To the detriment of students and teachers in the schools every day, these leaders ignore what it will take to remedy historic and chronic underfunding over the decades. Since funding for City school facilities come from both the city and the state’s Operating and Capital budgets, it is important to understand the difference between the two. The operating budget is used for routine building maintenance, smaller repairs, custodial staff, and energy and utility costs. By the state’s own measure of what “adequate” funding should be, City Schools is underfunded by $290 million a year (as of fiscal year 2015–that shortfall is higher now), which affects how much funding can be dedicated to facility maintenance. City Schools needs more funding to ensure sufficient staff and operations for routine and preventative facility maintenance, without taking funding from the classroom. In an August memo, the ACLU-MD provided suggestions to the Kirwan Commission, which is responsible for developing a new state education funding formula, to ensure that adequate facility maintenance and operation dollars are included in their final report. To renovate or construct new schools and replace mechanical systems and roofs, school systems use their capital budget, which is provided to them by the state and local government. According to industry experts, at least two percent of the total replacement cost of all school buildings should be spent annually on capital renewal. In 2012, City Schools’ facilities consultant reported a $2.4 billion need to correct deficiencies in City school buildings. Approximately $4 billion was needed to replace all school buildings. In 2018, the price is probably closer to $5 billion due to cost escalation in the construction industry. For Baltimore City, this means that City Schools needs at least $100 million (based on a $5 billion replacement value estimate) each year for capital funding for school facilities. City Schools has received only about half of the amount needed annually over the past two decades. So, it’s no surprise that City school buildings have fallen into severe disrepair: leaks are plugged instead of replacing roofs and temporary repairs are made to outdated boilers instead of installing new HVAC systems. On average, City school buildings are fifty years old and in very poor condition according to industry standards. Their structures, such as roofs, and mechanical and electrical systems are far beyond their intended life. Most schools need a full renovation or replacement, and the work must be on a fast timeline as city schoolchildren deserve excellent facilities now. The longer that government officials allow these conditions to persist, the more expensive it will be, as costs rise from year to year. The time is now for the governor, mayor, and city and state elected officials to take comprehensive action. And there are feasible and proven solutions. After years of advocacy by the ACLU and allies, in 2013 the state passed the 21st Century Schools bill. This $1 billion City school construction program will rebuild 26-28 schools by 2021. Nine new and fully renovated schools have opened under this program since September 2017, with six ribbon cutting events this past August. That leaves nearly seventy-five percent of the City’s school buildings, which are mostly in poor condition, dependent on the small amount of capital funding—approximately $50 million annually—provided by the state and city. To ensure that all City school buildings are healthy and safe (with working heat and air conditioning, drinkable water, working fire alarm systems, and structurally sound roofs—not to mention science labs and performing arts studios) the state and city must allocate more funding to add more schools to this program. ACLU calls on the city and state to identify revenue to leverage the next $1 billion needed to fully renovate or rebuild the next 25-30 schools renovations and rebuilds. And while schools are being fully rebuilt, the city school system must receive enough funding for ongoing capital needs and enough operating funding for comprehensive maintenance. 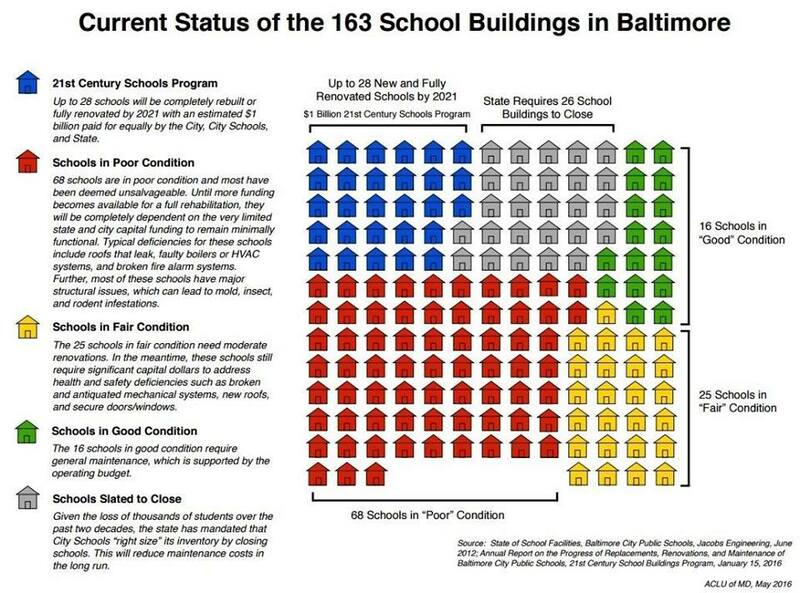 Wealth disparity is the primary factor as to why there is a huge difference in school facility conditions between Baltimore City and its wealthy neighbors. The state must recognize this disparity and take the necessary action to level the playing field. The simple fact is that high wealth districts like Anne Arundel and Howard Counties have much more capacity to contribute local dollars to school infrastructure. While the media is covering the back and forth blame game from elected officials, the impact on City students, parents, and school staff remains. It’s time for a real, comprehensive plan. Parents, Students, and School Staff in Baltimore City Schools: We want to hear from you. Did the heating and cooling issue affected your child’s school? Please tell us about it here.